In writing this review I discovered that Daniil Kharms’ 1939 novella, The Old Woman, is available to read online. However I urge anyone to hold back until they have seen Clout Theatre’s wonderful re-invention of Kharms’ surrealist story, as half the fun is putting yourself in their hands and watching how the inspired, frenetic lunacy eventually yields results and tells a very understandable story in a most absurd way. 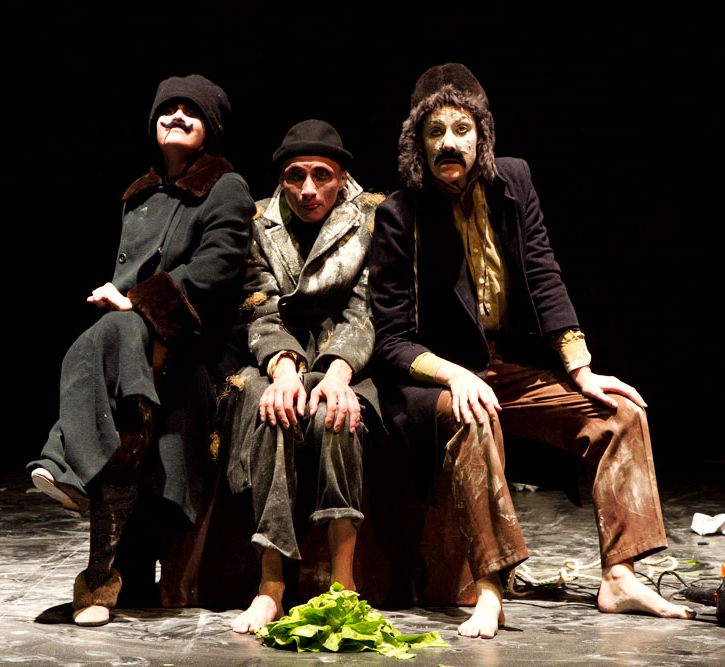 Clout delivers a highly stylised piece of physical theatre which draws as much of its inspiration from the innovators of early European cinema as it does from theatrical tradition. We see the expressionism of F.W. Murneau in the careful and controlled use of spotlights to create a sense of dramatic tension through the interplay between light, dark and the spaces in between. Alongside this there runs, in the writer’s relationship with the world, the slightly off-kilter, unreal societal pressure that works to create the crushing paranoia ofn Fritz Lang’s M.
It is how this keen cinematic understanding is set against a clear understanding of the demands of physical theatre that is most impressive. It is one of the hardest styles of theatre to get right, and when it goes wrong it is highly noticeable. The credit that can be given to practitioners, like Stephen Berkoff, who did so much to popularise the style in the UK is to point to all the terrible productions that followed in their wake that clearly assumed it was just a case of slapping on some greasepaint and a black polo-neck. The three actors, Sacha Plaige, Jennifer Swingler and George Ramsa, directed by Mine Cerci, stretch themselves to their physical limits. They understand that to perform grotesques they must reach extremes. Each gesture is exaggerated and each movement is set down with an absolute sense of its purpose and meaning. As a result every action has a function and a reason for existing, no matter how absurd it appears. One could apply this to any example but particular credit must go to Sacha Paige’s portrayal of the old woman. The intensity with which the clock face is presented and the mugging expressions that accompany her every action are a true masterclass in the art of the physical. I never thought that a dreamed creation would be quite as surreally unsettling as the dwarf in Twin Peaks but Paige’s old woman is a terrifying creation; a deathless force that acts as a constant reminder of the writer’s mortality. The company glean great humour from the text. There is an assured sense of slapstick and a physicality that at times surprises even the audience (I never thought I would hear of an audience gasp at the sight of a man being hit by a leek). There is even one bravura moment that is worthy of any theatre company – the visually arresting image of the writer eating his own words followed by his complete collapse, falling sideways off a table rendered into an endless moment by the accompanying snap to blackout. How A Man Crumbled is a highly impressive piece of work. It is theatre that has set itself a difficult task and understands very clearly how it will be achieved. Mine Cerci deserves much credit for the tight direction that underpins everything; from the highly technical lighting and sound design that support the physical endeavours of the cast to the way she has worked with the actors to retain the sense of absurd whilst managing to tell the overarching story in a highly understandable way. Clout Theatre may have an early billing in the festival programme but in return they have set an exceptionally high bar for the rest of the performers at Mimetic to meet. Hopefully this can be seen as statement of intent from a theatre company who fully deserve to break out of a relatively niche field. One can now only look forward to the rest of the festival to see who can match them.